Castle Comfort Stairlifts offers top brand stairlifts, keen prices and fast installs for all those seeking stairlifts in Lowestoft, Suffolk . And all work comes with our no-quibble guarantees and famous customer service satisfaction. Give us a call today on 01473 209 069 If however, you are looking for fascinating facts about the area then feel free to read on. Lowestoft in Suffolk is the most easterly town in the UK with Ness Point aka Lowestoft Ness marking the most easterly point in the UK. Here you’ll find the euroscope and flat, ground level direction pointer. It marks the direction and distance of a number of places in Europe from this point. Another fact about Lowestoft is that it has a very long history. Evidence of a settlement here dates back 700,000 years! Now we’re not suggesting that the population of Lowestoft is full of old fossils, but we do know that its population favours the retired and that more than 300 of those 12,500 retired living in the area already own stairlifts. You can see the figures notching up on the scrolling counter on our website. 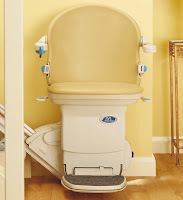 Castle Comfort Stair Lifts can’t claim to be nearly as old either; in fact we are mere babies with 15 years experience of supplying and installing stairlifts in the Lowestoft area. We’ve brought a lot of relief and contentment to those who have had a stairlift installed. Now they can deal with the stairs painlessly and safely. If you or a loved one is thinking about getting a stairlift, please give us a ring to discuss how we can help you, on 01473 209 069 . Lowestoft is on the North Sea coast on the edge of the Broads some 38 miles north of Ipswich and 22 south east of Norwich in Norfolk. Lowestoft’s industrial history since the middle ages has been fishing mainly for herring right up until the last century. It competed with nearby Great Yarmouth for size and industry. Now there are just a few small fishing boats – no trawlers – left. One thing that does remain is the research centre, the Centre for Environment, Fisheries and Aquaculture Science (CEFAS) which is based in Lowestoft. It also had a substantial porcelain industry during the 18th century. The factory where the soft-paste porcelain was made was the longest operating in the UK after Royal Worcester and Royal Crown Derbyshire. Until a couple of decades ago there was a boat building industry centred around the docks. There is still some ship building and repairs carried out there today but most of it has since gone. More recently industry in Lowestoft centred around the oil and gas industries. Shell’s Southern Operations were based in Lowestoft Harbour employing hundreds of people in the area until 2003. Oil and gas are still important in the area but Lowestoft is developing as a centre for renewable energies: it has a wind farm about 15 miles offshore, the Orbis Energy Centre has been set up to attract business to the town interested in green energies and featuring solar powered thermal energy. They are also trialling prototypes of tidal and wave power. Of course its other main industry is tourism. Bathing in the sea here began back in the middle of the 18th century and Lowestoft remains a popular tourist destination to this day. Lowestoft is on the Sunrise Coast. It has two ‘Blue Flag’ beaches, two piers, a theme park plus an Africa Alive attraction just a little way from the town and of course a Pontins Holiday Camp. Pleasurewood Hills theme park was started in 1982 and has a number of attractions to thrill holiday makers including 3 roller-coaster rides, 3 ‘thrill’ rides, 2 water rides and many more. Just 4 miles south of Lowestoft is the village of Kessingland where Africa Alive can be found on the site that used to be Suffolk Wildlife Park. It is now identified as an Africa-themed zoo where you can see a number of primates including a variety of Lemur – Mongoose, Black, Ring-tailed, red bellied etc. There are also Common Chimpanzees and Vervet Monkeys. There are birds, mammals and reptiles to be seen too. Looking at traditional costal attractions, there are the two piers that offer more entertainment for holiday visitors; there’s also Lowestoft’s High Lighthouse which was originally built on the cliffs above the Denes in the mid 17th century. It’s original lights were candles! The lighthouse that is there now was built in the 19th century and is 16 metres high; its lights show their warning beams for 23 nautical miles and has been automated since 1975. If getting up your stairs feels as big a problem as climbing to the top of the lighthouse it’s time you got in touch with us at Castle Comfort Stair Lifts. We can assess you to see what sort of stairlift is right for you – a straight stairlift or a curved stairlift. We can have it fitted the next day in all probability. If it’s the cost that concerns you, you can check our stairlift prices and compare stairlifts; remember we also supply reconditioned ones which cost somewhat less. And of course there’s always the possibility of a grant or a 0% finance package to make the purchase possible. Call our local office for more information on 01473 209 069 . Lowestoft has seen a few famous faces in its time including composer Benjamin Britten who was born here. Sir Christopher Cockerell who invented the hovercraft lived in nearby Oulton Broad. Admiral Sir John Ashby who commanded HMS Victory in 1692 and fought in the Battles of Barfleur and La Hogue grew up and is buried here. Thomas Nashe known as one of the ‘fathers’ of modern journalism’ was born here; he was an Elizabethan phamphleteer and one of Shakespeare’s primary reference sources. 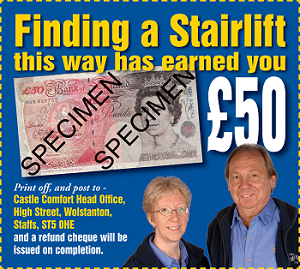 If you want to be the first to put a foot on your very own stairlift then please give us a call. We won’t go for the hard sell and you won’t regret it. Don’t forget you can use the £50 off voucher at the top of this page towards the cost – give us a call today on 01473 209 069 . Lowestoft is an amazing city: tourism, African animals, attractions, sea.Has everything you need! It also seems to be very quiet since retirees choose ..... or will all the benefits it offers them comfort Castle Center and the stairlifts? Thanks for letting us improve the quality of life of our elders.